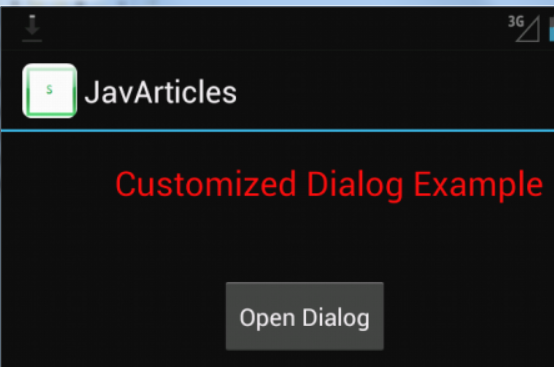 In this article, I will show you an example of android dialog. When you launch the application, you will see a button. Click on the button and a dialog box will open. The dialog box will have some text and a button to close the dialog. I have kept the example simple so that our main focus would be on the usage of Dialog API. Following the concept of decoupling view from controller, we will create a new xml layout file that represents the content of Dialog box. Create Dialog box and set the dialog’s content to the XML layout using dialog.setContentView method. Call dialog.show() to open the dialog. 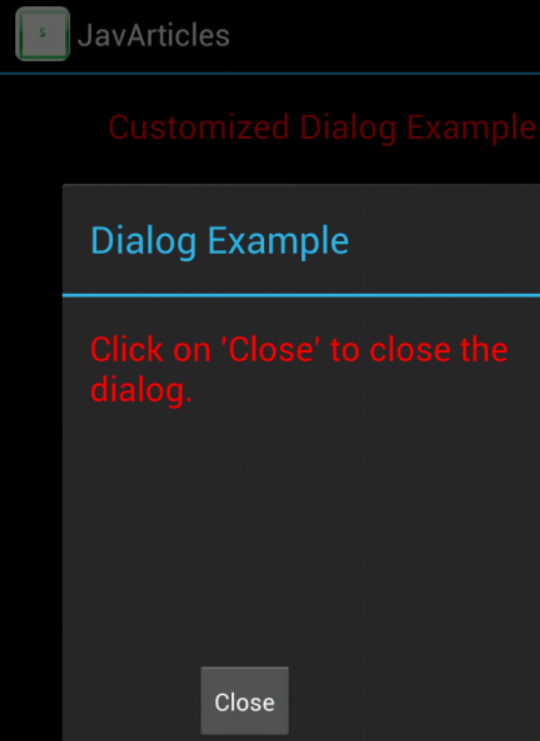 Call dialog.dismiss() to close the dialog. Our dialog layout is very simple, it contains a text field and a ‘Close’ button to close the dialog. This is our main layout which contains some text and a button, clicking which will open the dialog. Let’s create the dialog and set its content. Our main page will contain the button to open the dialog. In our activity class CustomizedDialogExampleActivity, we will set its content to the main layout welcome.xml. Let’s now create the dialog box using Dialog(context), we will pass the current activity instance as the context. Next, we will set the title using dialog.setTitle and then the dialog’s content view using dialog.setContentView. Now we need to setup the listeners, the first one for opening the dialog and the second listener for closing it. We want to open the dialog when the ‘Open’ button is clicked. There is also a button in the dialog’s layout which will allows us to close the dialog. Set the button listeners using button.setOnClickListener. In order to open the dialog, we will call dialog.show() and to close it we will call dialog.dismiss(). Let’s start the application and click on open to open the dialog. Click on close button to close the dialog. Dialog Box. Click on ‘Close’ to close it. In this example, I have shown you how to create dialog, open and close it.